Jane McNicholas, Consultant Oncoplastic Breast Surgeon; Dr Anna MacPherson, Consultant in Palliative Medicine at East Lancashire Hospitals NHS Trust; Dr Karen Oliver, GP Partner at Lancaster Medical Practice; Lauren Mahon, presenter of Radio 5Lives You, Me and the Big C; and Professor Kinta Beaver, Professor of Cancer Care at the University of Central Lancashire. 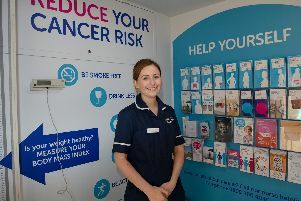 A cancer care discussion drew a crowd to Burnley as experts, students and members of the public took part in a one-off health event. The debate, which was organised by the School of Medicine at the University of Central Lancashire, saw four cancer professionals face questions tackling key issues such as: the under representation of ethnic minorities in screening programmes; lifestyle choices that can reduce the likelihood of developing cancer; the impact of cancer on patients, their families and friends, and how health services and charities can improve their care and support. Radio presenter Lauren Mahon, who co-hosts the BBC Radio 5Live podcast ‘You, Me and the Big C’, led UCLan Burnley’s Question Health event. It was arranged in honour of journalist and former UCLan student, Rachael Bland, who sadly died from breast cancer in September last year. And Lauren, who is in remission for stage three breast cancer, had nothing but positive comments about the event. She said: “The reason an event like this is so important for us is because we sit on a panel full of experts and have the conversations face-to-face in front of other human beings and we get to see their reactions. Co-presenter of multi award-winning podcast Deborah James, who was supposed to sit alongside her podcast partner, unfortunately couldn’t make it due to illness, however a strong and knowledgeable panel made for an educational experience for UCLan medicine student, Dean Hardy. “I thought the event was really good, really insightful about cancer as a whole. From a medical student’s point of view there’s a lot to understand. Much more than just the diagnosis,” he said. Bex Lewis, a senior lecturer in digital marketing, was diagnosed with a spinal metastasis in January, after finishing treatment for breast cancer in May 2018. She came to the event with three women she met on a building resilience against breast cancer Facebook page, and had nothing but high praise for Lauren, the panel and the whole event. The event was recorded by UCLan’s production students and will be screened on Showcase, Sky channel 192 and Freesat channel 161, on Wednesday April 10th, from 7pm to 8pm.